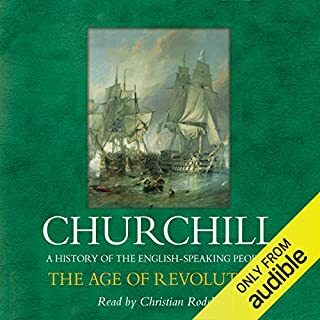 This volume brilliantly recounts how Churchill organized his nation’s military response and defense, compelled President Roosevelt to support America’s beleaguered cousins, and personified the "never surrender" ethos that helped the Allies win the war, while at the same time adapting himself and his country to the inevitable shift of world power from the British Empire to the United States. More than 20 years in the making, The Last Lion presents a revelatory and unparalleled portrait of this brilliant, flawed, and dynamic leader. This is popular history at its most stirring. This is the third volume of William Manchester's biography of Winston Churchill. 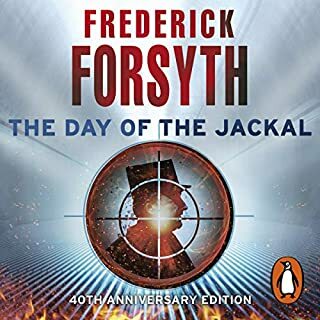 I first read the second volume, about the decade leading up to the German invasion of France, 25 years ago and thought it was so good that I bought and read the first volume. I had, by now, given up hope of ever seeing the third volume, but Mr. Manchester appears to have asked Paul Reid to complete the book and, when I saw it available on Audible, I immediately bought it. This book is billed as a biography (and so it is) but Winston Churchill’s life was so intertwined with the British participation in World War II (he served as both Prime Minister and Defense Minister) that this book also serves as a political (not military) history of British involvement in the war as seen through British eyes. There is little military coverage per se but the political decisions behind the military moves are discussed in great detail. 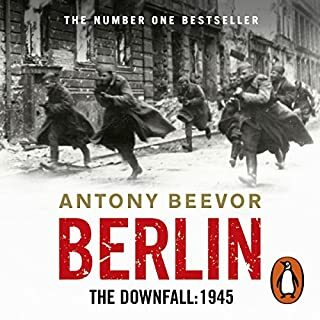 While this book covers the period from 1940 through 1965 (beginning where the second volume ended) it is primarily concerned with Churchill’s actions during the war with approximately 90% of the book covering the period up to the end of the war in Europe and his loss of the office of Prime Minister. The book’s description of the political views of the Allies, its descriptions of the leaders and their conferences is really first rate. Mr. Reid has added liberal excerpts from the diaries of many of those involved, both Allied and Axis, and the resulting picture of how the war progressed, how the decisions that had to be made were reached and how the various participants reacted to the decisions transcends anything I have read before. 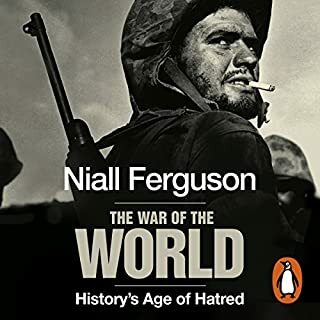 I have read many histories of World War II, but all of them spent a great deal of time covering the battles whereas this book dwells primarily on the political decisions to be made and how and why the decisions were reached. The portraits of some of the leaders presented in this book are the best I have seen outside of biographies of those people themselves. The picture of Joseph Stalin, as presented in this book, is very different from that presented in other books, presumably because it is the view of him as seen by Churchill and his aides, not as seen by Soviet Marshalls or allied diplomats and one is drawn to the assumption that Stalin, like all of the other leaders, could present many different faces as needed. 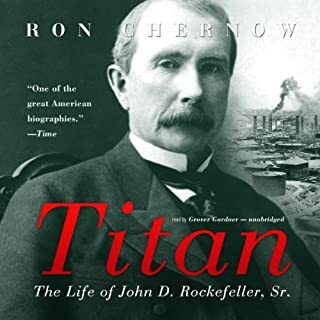 Similarly the portraits of people like Harry Hopkins, Cordell Hull, Anthony Eden, Alan Brooke, John Dill and others presented in this book seem much richer than I have seen in other books. 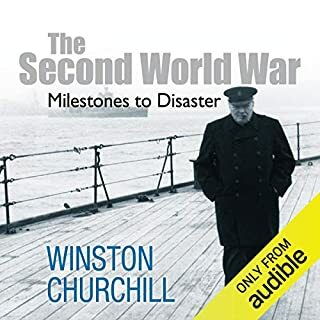 One of the books on my wish list was Max Hastings’ book “Winston’s War”, but this book is so well done and covers Mr. Churchill’s wartime involvement so well that I am not sure there is anything in Mr. Hastings’ book that would contribute much new and I am now uncertain as to whether or not it is worth buying. I thought I knew the events of the war from my earlier readings, but after reading this book I realized that there was much that either I did not know or which I understood imperfectly. While I do not wish to spoil this book for others I can say that I did not know how fragile the Allied coalition was at times during the war or how much disagreement there was between the British and the US on strategy. Yes, I knew that the US favored a cross-channel invasion and the British wanted to pursue a Mediterranean strategy but I did not know how strong the disagreements were, how dedicated some of the military and political professionals were to one choice or the other or how the final agreements were reached. This book is a treasure trove of information about how and why the political decisions were reached and I recommend it without hesitation to anyone interested in knowing the background behind these decisions. It is one of the finest books on the war that I have ever read. The last 10% (or so) of the book covers Churchill’s life after he lost of the office of Prime Minister and after the end of the war. It covers, in considerable detail, his work in opposition to the Labor Party and his efforts to create a “United States of Europe”. While I understood how he, almost alone, understood the coming Nazi menace I was not aware of how he continued to predict the course of political events after the war. His foresight in seeing the coming cold war between the West and the Soviets and his efforts to preserve freedom and security during the late 1940s and early 1950s was new to me. It is also a very personal book and, at the end, I had tears in my eyes at the passing of such a great man. 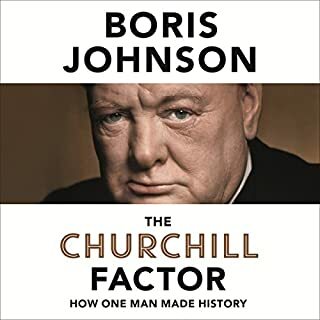 The book is read wonderfully by Clive Chafer who does a passable impression of both Winston Churchill and Franklin Roosevelt. One reviewer complained that the book is read by an American, but that is only true of the introduction, which is read by the author. The rest of the book is a pleasure to listen to. This is a worthy conclusion to the monumental first two volumes of this trilogy and I cannot recommend it highly enough. To answer the review of someone who complained about the "American narrator": it surprised me too, until I realized that only the first part of the narration was read by Paul Reid, the co-author, he of the broad accent and mis-pronunciations. After he has described the character of Churchill, the competent (and British) Clive Chafer comes in and picks up the story. So just hang in there for the intro: it's a couple of hours long, but smooth sailing from then on. And after all, it was an American (in fact, two) who wrote this, so their voice should be in there somewhere! Churchill and World War II till his death. This was the last book in the series and William Manchester died before it was finished. Paul Reid took over and it shows that there was a different author. This was the book I was so looking forward to listening to and it just didn't match the quality of the first two books. There is a lot of repetition from the previous books and it really drags in a lot of spots. They also had a new narrator and he just didn't get the Churchill voice as well as the other guy. That being said, this book is mostly about Churchill and WWII. Since he played such a large part in the war it is very engrossing. Sad to say once he was able to get the United States in the war he lost most of his control of the Allied Forces and it began the loss of world leadership for Great Britain. He was one of those remarkable men that come when the world needs them and does what needs to be done. He was not a perfect person, and woe be it to anyone who worked for him, but he hardly slept and was constantly working on a book, a picture or the war strategy and his people were expected to keep the same pace with him. I consider him one of the greatest people to have ever lived on this earth and I am glad I read all three books of his life. 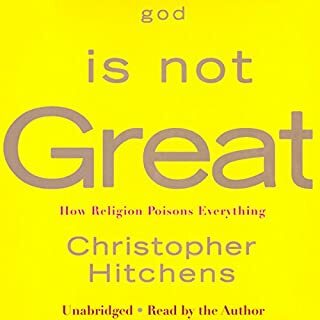 This book ranks in the pantheon of biography along with Caro's treatment of Johnson and Moses, Cate on Nietzche, Sereny on Speer, Ward on Roosevelt, and Morris on Teddy Roosevelt, in other words, unmatched, without peer(and yes I've read all of the Gilbert Volumes, Jenkins, and Rose) amazing, and wonderful. The first two volumes of Manchester's biography of Churchill were some of the finest work by one of the best biographers who ever lived. So how can a relatively unknown writer hope to step in and fill Manchester's shoes? Paul Reid, working from Manchester's research and notes, has done an astonishingly good job. Oh, there are a few missteps, but they're relatively trivial. Reid has not imitated Manchester, but rather has followed his approach to the story and the people involved and made the same kinds of choices Manchester made. That means the biography is opinionated - and Reid is faithful to the worldview Manchester demonstrated in the first two volumes. This book is not afraid to pass judgment; but such judgments are always fully justified, in the text, by the sources and the outcomes. Nor are Manchester and Reid so in love with Churchill that they overlook his flaws. He could be annoying and hard to work with, and those who worked with him were often frustrated with his scattershot approach to strategy and, well, everything else! But Manchester and Reid make it clear that much, perhaps most, of such criticism was unjustified or, in the end, trivial compared to Churchill's achievements. Churchill's life deserved a great biography, and this is it. The only flaw is that Clive Chafer artificially deepens his voice; but his natural voice isn't really that deep, so the effect is that he's working with only half his range. Sentences never sound quite finished, because he can't drop his pitch lower than it already is. The result is a constantly annoying sense of incompletion and tentativeness that does not suit the text at all. Maybe if the earlier volumes hadn't been so brilliantly read I wouldn't mind so much, but somebody needs to tell Chafer that he's a tenor, and he should read accordingly, so we get the benefit of his full vocal range. 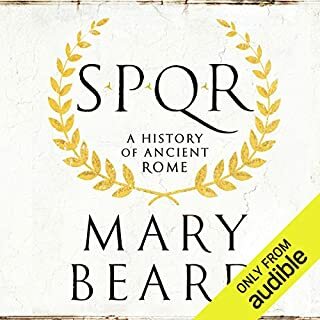 Having just completed listening to the Audible.com version of this work, I can’t say enough good about either the quality of the book or the quality of the reader. Amazing to me that in the books 1200 plus pages, my interest in the narrative never flagged.Lion is more than a biography; it’s also a detailed history of the Second World War. 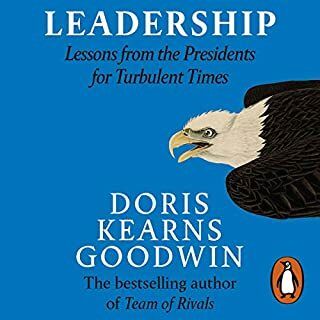 While listening to Lion, I have been reading No Ordinary Time (Doris Kearns Goodwin, 1995) , which covers roughly the same time and the same characters. I’m enjoying Time, but it doesn’t compare favorably with Manchester-Reid’s book. Surely part of the charm has been the reading. When speaking Churchill’s words, Nelson Runger sounds like Churchill—all you’re missing is the static. 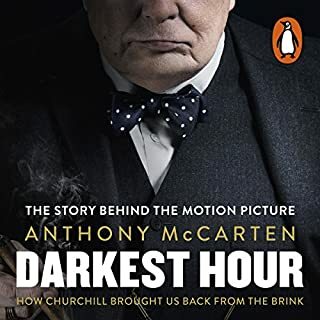 I can’t help speculating that the publishers made a conscious decision to include in the biography a great deal of peripheral information about the war and the times that Churchill lived in. The only instance I recall in which the authors refrained from inclusion was in following into the future the creation of the European Union—an objective that the great man had in view decades before its birth. 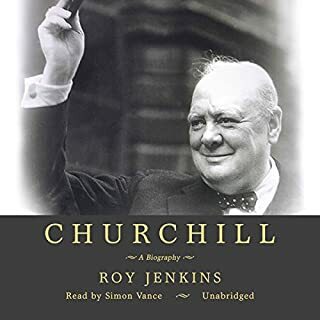 Finally, and perhaps because this period of time—the war years—were so dramatic, I thought this volume far surpassed in engaging my attention and capturing my imagination the earlier two Manchester volumes on Churchill’s life. 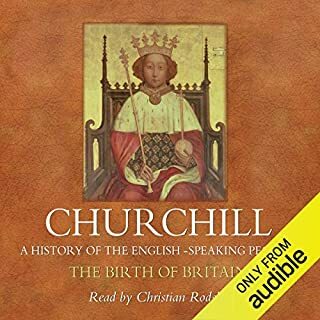 Indeed, I next will listen to yet another Churchill biography in the hope that it can approach the quality of this one. Heavy Drinker. Never Exercised. Saved the World. When a book is this good (and as universally lauded as this one has been) there is really not much one can say. But I’m sure I’ll find something. First, the Author’s Note, read by the Paul Reid, is a touching explanation of how he got the job of finishing The Last Lion. A writer myself (though on nothing like this scale) I could sympathize with a writer confronted by a mountain of notes taken by another man, now dead, who had color coded them in a way only that man could understand. 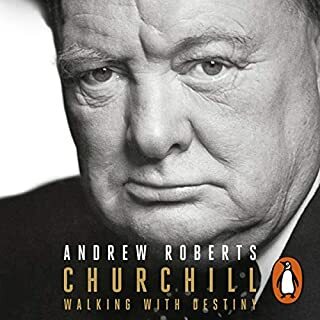 The Preamble, also read by Reid, is a short, revealing portrait of Churchill: his talents and shortcomings, his endearing and infuriating qualities—for both his friends and his enemies, foreign and domestic. It makes a fine listen in and of itself. The far more massive book that comes after that—the final third of an even more massive literary venture—is a piece of writing that is paced just right. The years we want to hear about, 1940 through 1945, are given in detail that is thorough without being excruciating. And, while a straight-up academic biographer would probably have felt compelled to treat the last twenty years, 1945 to 1965, with the same exactitude, Reid opts to handle them more deftly. While it is sad to see the pivotal figure that essentially saved Western Civilization slip to junior partner status after America enters the war, it is even harder to see the man who had been a lambent flame of physical and mental energy his whole life drift into senility. Reid has the sense and taste to draw a curtain over much that could have been written. Bless him for that. Reid’s style is spot-on as well. It has been said of Manchester that he wasn’t so much an historian as a storyteller, and Paul Reid follows faithfully in those footsteps. The story of the man, his triumphs and failures, is always center stage and always moving forward. Because this is written as a story—as opposed to academic history—it makes perfect listening. It also helped that I’ve spent the last few years reading up on the Second World War, especially the European and African theaters. Thus I was able to follow the paths of the armies without having to hit “pause” and go dig out maps. Finally, the narration is every bit as good as the writing. 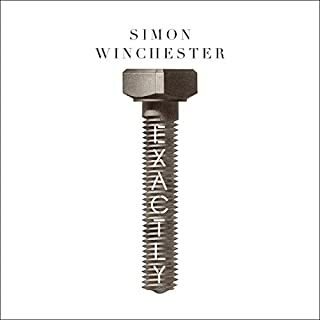 Clive Chaffer’s pacing and diction are superb throughout, especially his way of delivering every one of the great man’s words, spoken or written, that appear in the text with a Churchillesque inflection. His studied avoidance of giving any other character in the story a unique voice helps keep Churchill the focus of the tale. At 53 hours one might entertain qualms about listener ennui. But one would be wrong. Maybe it’s just me, but I cleaned the kitchen, rode to work and back on the train, folded laundry or just sat and sipped a drink, the man and the war becoming more and more a part of my mental makeup. I didn’t so much listen as absorb. William Manchester chose the right man to carry on and Audible chose the right reader. In an age obsessed with youth and fitness and hooked on movies based on DC Comics superheroes, it’s refreshing to realize that the man who really did save the world was a heavy drinker who never exercised and displayed his greatest heroism at an age when most men are contemplating retirement. 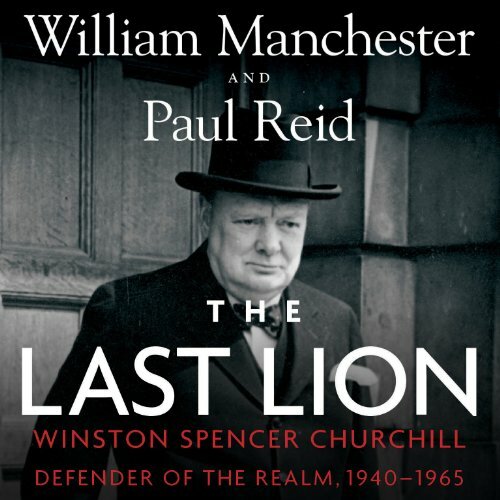 If you could sum up The Last Lion: Winston Spencer Churchill, Volume 3 in three words, what would they be? The whole work is excellent. Loved the switch from biographical part to general WWII history details. A must have for history fans. It is quite a lengthy volume, but it is never dull and very well worth the time. 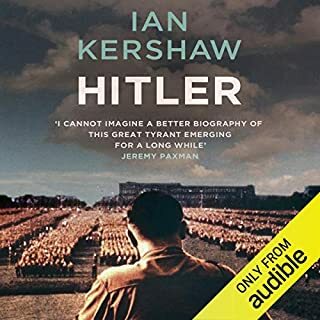 While the first two hours (introduction) is read by the author Paul Reid, the rest of the book is narrated by Clive Chafer a wonderful (English narrator). Mr Reid is a worthy collaborator with WM for this perfect third volume. It is as great as it's preceding first two, worth waiting for. Too bad the other reviewer did not hang in there. In my opinion, Mr Reid had the right to read his own introduction. The first 2 instalments of this trilogy-were, for me 2 of the most beloved books I have ever read/listened to. 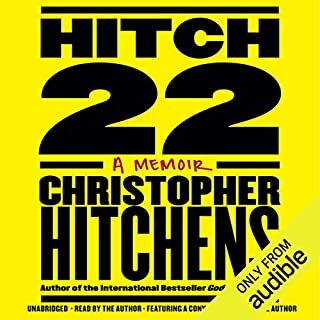 The writing was an utter revelation for me and that level of stunning art has been achieved by perhaps 5 or so other books out of the 1100 titles I've listened to over the last 5+ years of audible books AND all the other books I have read in book form. Robert Caro's works come to mind as those that are at least equal in brilliance. Like so many other frothing fans of these first 2 books, I learned that Manchester had died leaving the 3rd books research and start to paul reid to finish. I like so many other fans followed any sign we could find ( for years) that would indicate when our Manchester "fix" would be released. When the time finally arrived for the audible release I noticed that there was no sign audible was aware of it. I called audible and they thanked me for the heads up and released it. I've just bored you with this blurb so you might understand my emotional involvement. When I started the book I was horrified. I have NEVER EVER heard worse narration. This was someone who was not only reading the text without being prepared, this was like listening to a 8yr old read. 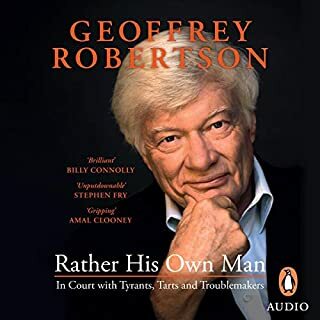 Luckily Reid was responsible for just reading the lengthy "preamble" Clive Chafer's narration of the rest of the book was for me annoying because his intonations were exactly like a BBC news anchor or reporter. Despite all this I listened carefully to every word. Before I get into my review of the writing of the book itself, I must first make it understood that I think, feel and want to acknowledge that poor Mr. Reid had a hurculean task in writing this book as we can imagine after reading his introduction which explains the huge piles of disorganized research and indecipherable piles of notes he had to contend with.And of course he was put in the position of trying to write in a style that at least compliments the first 2 books- and that style is one of very high standing. Imagine you had to write the 3rd book of lord of the rings for instance (for lack of a better analogy) All of this being said ,we still have to judge the book on its merits alone. I think by now you can infer that Im not enthralled with the book but if you hang in there you may find it interesting why. The task laid before Reids feet was to finish a BIOGRAPHY of Churchill and what has been written is a history of ww2. Ironically if you want a better version of this book with more about Churchill read Churchill's amazing 6 vol THE SECOND WORLD WAR. As I have read his ww2 there was nothing at all new for me, So I thought well at least I'll get his biography post ww2. I was astounded to find that his last 10 yrs were given just 17 pages out of 1053! and titled "postscript" in the book form. This would have been fine if the intended purpose of the book was a ww2 history but its NOT- its supposed to be a biography. His last ten yrs should not be BESIDE the point- THEY ARE THE POINT. Beyond this huge flaw, this isn't even very well written and certainly doesn't come even close to Manchesters standard. I wondered how the New York Times rated it so I looked it up and was heartened to find they found this book just as I did. Of course You can check for yourself. I thank those that hung in to the end of this very long review and hope you got something out of it. What does Paul Reid and Clive Chafer bring to the story that you wouldn’t experience if you had only read the book? At over 53 hours, this is a vast undertaking to listen to, let alone to have written. It starts just before Churchill takes power in May 1940 and ends with his death. The earlier volumes were written by William Manchester alone, whilst this is written almost entirely by Paul Reid, using the notes compiled by the dying Manchester. With good narration, this is a competent telling of the great man's story, rich in detail. It is written with an American audience in mind, covering most key moments well. I say "most", as there are some that I feel lack some relevant detail. An example would be the machinations around Churchill's appointment in 1940, the rumblings of revolt amongst the establishment for peace in the months after his appointment, and Yalta, which is disposed of in jarringly short order. The years after Churchill's loss of the 1945 election are covered in the last 8 or so hours of the book. This seems too short; he was, after all, Prime Minister for much of the 1950's, and lived for a further 10 years, if increasingly frail and inactive. Another area which lacks critical analysis is the relationship between Churchill and the Americans, especially Roosevelt. It is clear that Roosevelt handles Churchill with calculation and barely concealed cynicism. Churchill, for his part, appears extraordinarily naive in comparison, although this may be simply a realistic acceptance of his subsidiary role. This critical nexus in his life demands critical analysis, especially when so much of the book describes these dealings in detail. Perhaps this is hard for an American to do, perhaps Paul Reid's relative inexperience meant he had his hands full just getting all of this down. Nevertheless, these are minor criticisms given the scale of the work. It rams home what a wonderful, full life this great man led. This was a very long and in depth look at the life of Winston Churchill from his own perspective. It was put together beautifully and I loved the Churchill iteration when the words were from direct speech. It clearly showed the dry and acerbic sense of humour that was a constant throughout Churchill's life. As subtle or un-subtle as it seemed to be depending on the occasion.